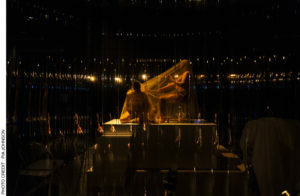 In August 2018, Australian theatre maker and director Samara Hersch, along with Chamber Made, a company operating at the ‘nexus of contemporary performance, music and sound’, presented Dybbuks – a production in three acts exploring ideas of possession; of women being with the dead; of desire, ritual, and voice. Here, Nicola Menser Hearn reviews the production and discusses it with Hersch. On making community and a Yiddish feminist podcast, or: where the academy ends and the self begins.